Hagia Sophia - As the most famous landmark in Constantinople (later Istanbul), the Hagia Sophia stood as the centerpiece of the city for a thousand years. After it was built, it became a symbol of the Roman Empire's transformation to both a Christian and Greek kingdom. For it's name, Hagia Sophia, comes from the Greek, Άγία Σοφία, meaning "Holy Wisdom". Commissioned by Emperor Justinian and built between 532 and 537, it stood as the largest cathedral in the world for nearly a millennium and became the standard for Byzantine architecture. It was not the first church built on the site, but the third. The previous two burned down, the second in 532, same year the Hagia Sophia was begun. Justinian was determined to build a church more magnificent than anything seen previously in the empire; one worthy of the grandeur of Constantinople. Its dominant feature, of course, is its massive dome, which stretches 110 ft (33.5m) in diameter. It's actually the second dome put in place. The original one collapsed in 558. It was determined to be too heavy and too flat. So the new one was built using lighter materials and raised by thirty feet, bringing the basilica to its current height of 182 ft (56m). Despite the collapse, as well as the building taking damage over the centuries from several earthquakes, the Hagia Sophia has stood relatively intact for 1,500 years now; a testament to its solid construction. Before it was ever captured by the muslims, it fell into the hands of the western Catholic Church during the the Fourth Crusade. After 57 years, it returned to Byzantine possession. 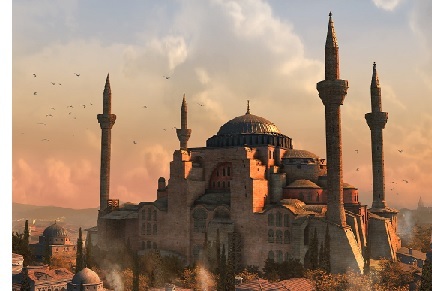 Then it famously was converted into a mosque after Constantinople fell to the Ottomans in 1453. It remained so until 1931 after the Ottoman Empire fell. The minarets which are familiar to today's Hagia Sophia were added in the following years. Its Byzantine architecture was the basis for several mosques, such as the Blue Mosque, built in the now named city of Istanbul. In 1935 it re-opened as a museum, which it remains to this day.